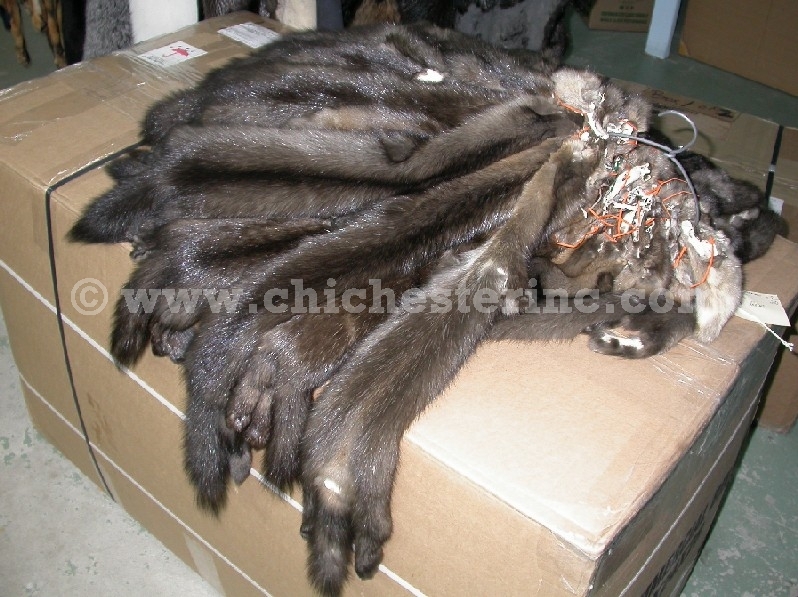 We offer fashion-quality Canadian sable skins. These skins are warehoused in Canada, so please allow 4-6 weeks for us to clear them through U.S. Fish & Wildlife Service. We can ship directly from Canada to countries other than the U.S. without having to clear USFWS. All overseas orders must be paid in advance by T/T. Unlike the picture, the skins currently available do not have tails. The tails are frequently removed prior to tanning to save tanning costs. Sizes vary somewhat from one skin to the next. One sample skin we measured at random had the following dimensions: from the tip of the nose to the tip of the tail was 28"; from the base of the tail to the ears was 18"; the width in the middle of the body was 3" on one cased skin. The skins will be wider at the rump and narrow at the ears. Expect useable length (from the back of the ears to the rump) to vary from 17-19". Many of the Canadian sable come from the North West Territories. All Canadian skins are from wild stock as there are no ranches in Canada. Some Russian sable are ranch raised. Genus and species: Martes americana. Canadian sable are not endangered and are not controlled by CITES. Please click HERE for Russian sable. For more affordable, trading post-quality skins, please click HERE to see our entry on Marten.